Financing Cosmetic Procedures with Health Smart Financial Services™. At Onyx Medical Aesthetics, we realize that pursuing your cosmetic goals can be an expensive endeavour. Because of this, we are pleased to offer our clients financing options over 6-12 month periods. For any service in our clinic above $300 CAD, we are pleased to be able to offer our patients financing for their Cosmetic Medicine treatment through Health Smart Financial Services™. Health Smart Financial Services™ is a ‘point-of-sale’ financing system, meaning everything is done at the clinic where you are obtaining procedures. Their automated system lets applicants know if they have been approved instantly. Once an application is uploaded into the system by your clinic the result is displayed on the screen within 2 seconds. 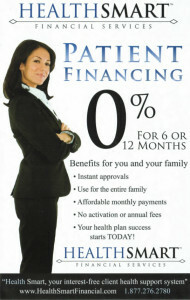 This truly makes financing cosmetic procedures a quick, simple, and affordable event. Financing cosmetic procedures enables our patients to pursue their cosmetic goals without the financial stress of having to pay upfront. Because Health Smart is an online application process, we are able to offer financing at all of our locations across Ontario. In order to apply we have to validate your identity so we require 2 pieces of ID, one of which needs to be photo id from a government body, e.g. drivers licence or passport . Please bring these with you to the clinic is which you are obtaining services. (Health Cards are not permitted from Ontario, Manitoba or Quebec). All consultations at Onyx Medical Aesthetics are complimentary. On top of financing cosmetic procedures, we also offer package deals for services that require multiple treatments, such as PicoSure Laser Tattoo Removal, cellulite removal with Mesotherapy, and the Selphyl Vampire Facial treatments. To learn more about the costs that may be involved in your cosmetic treatments, please visit our Contact page and submit the form. For regular updates on promotions and new treatments being offered, follow our Facebook page.